It was during a trip to New Zealand with his father that Thomas Platts-Mills, at the ripe old age of 9, decided to be a doctor. There he met his grandmother, Dr. Daisy Platts-Mills, and came to understand the origin of his surname. “Dr. Daisy Platts married Mr. Mills in 1902 and said, ‘We will be Platts-Mills,’ and it’s lasted five generations now,” he explained in a genteel British accent, noting it’s the oldest double-barrel name in the world created by a professional woman. Platts-Mills, now head of the University of Virginia’s Division of Allergy and Clinical Immunology and known around the world for several groundbreaking allergy discoveries, made good on those promises to himself, studying at Oxford’s Balliol College like his father, receiving his medical training at St. Thomas’ Hospital Medical School in London and earning his Ph.D. from London University. Approaching his 50th year of research, he has become what his friend and former UVA colleague Dr. Martin Chapman calls “a living legend” and “the most insightful clinical investigator of allergic diseases of his generation.” Among other honors, he is the first allergist to become a fellow of the Royal Society, the United Kingdom’s national academy of science and the oldest scientific academy in the world. He has twice received a merit award from the National Institutes of Health for his work. Platts-Mills’ most recent acclaim has come from his now-famous discovery, beginning about a decade ago, of a red meat allergy caused by tick bites, leading to hives, anaphylaxis and possibly heart disease. Since his article on the allergy was published in the New England Journal of Medicine, it has been cited more than 1,000 times and has been the subject of media attention across the globe. His earlier work on dust mite allergens was also pivotal, shedding light on the association between mite allergies and asthma and highlighting early‐life allergen exposure as a risk factor for allergic diseases. That work has helped doctors and patients around the world better understand asthma and its causes. Chapman, who worked at UVA from 1984 to 2001 and is now president and CEO of Charlottesville-based Indoor Biotechnologies, attributes much of Platts-Mills’ success to his “methodical approach” and fearlessness. “That has certainly been a feature of his work – to not be afraid to put yourself out there and investigate an idea somebody else might reject instantly,” he said. While Platts-Mills credits his grandmother with guiding him to medicine, his father’s influence profoundly shaped how he approaches his work and the world. John Platts-Mills was a strident socialist who worked as a criminal lawyer, a coal miner and, finally, a member of Parliament. A Labour Party member occasionally ostracized for perceived communist sympathies, he was elected to Parliament in 1945, ousted in 1950, and went on to establish himself as one of Britain’s top criminal barristers, representing high-profile clients like notorious gangsters the Kray twins and the Great Train Robbers. Platts-Mills recalls those roller coaster years as being formative in his own outlook. That attitude has shaped Platts-Mills as a person and a researcher. As colleagues and friends know, he has a mischievous sense of humor and enjoys playing devil’s advocate – poking, prodding and challenging assumptions. It has been the basis for his biggest scientific breakthroughs. 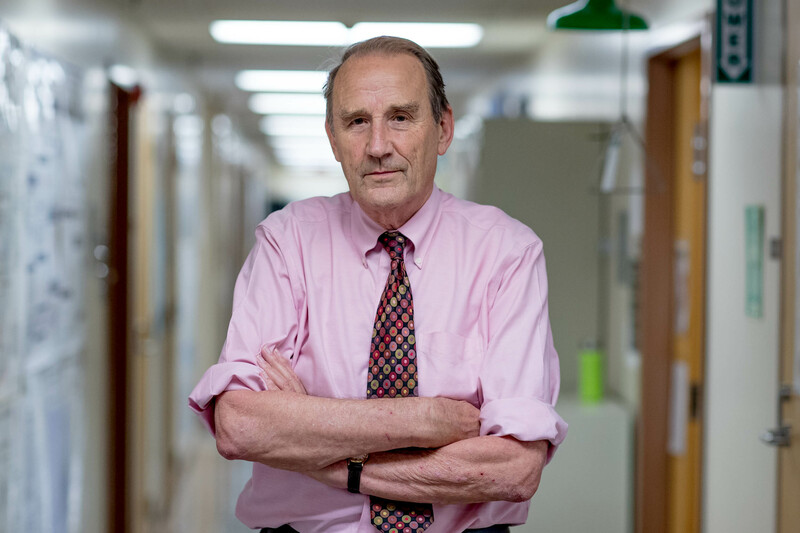 Platts-Mills found his focus and a mentor in the 1970s as an allergy fellow at Johns Hopkins University, working for Dr. Kimishige Ishizaka. Ishizaka had just discovered immunoglobulin E, antibodies produced by the immune system in response to environmental allergens. Shortly afterward, back in England, Platts-Mills embarked on his groundbreaking dust mite work with Chapman, an undergraduate to whom Platts-Mills offered a Ph.D. position. Platts-Mills, Chapman and Dr. Euan Tovey worked to purify the house dust mite allergen and ultimately determined that mite feces were the source of the allergen. The discovery was transformative, and helped to explain why allergic sensitization to mites was so strongly associated with asthma. The impact came both from understanding that patients had no awareness of the role of dust mite allergens and that the chronic hyper-reactivity of the lungs was a major target for treatment of asthma. Platts-Mills came back to the U.S. in 1982 as UVA’s Oscar Swineford Professor of Medicine and head of the division. The chair had just been established by fellows trained by Dr. Swineford. It was at UVA, in 2007, that Platts-Mills first discovered a red meat allergy transmitted by ticks. It started when he realized that the sugar alpha-gal was an ingredient in the cancer drug cetuximab and was causing allergic reactions in patients from certain geographic areas. Expanding on that, his team found that the sugar alpha-gal was also connected to a mysterious red meat allergy cropping up in similar areas. After meticulously testing patients, they determined that the bite of the lone star tick caused the allergy. Along the way, Platts-Mills developed the syndrome of delayed anaphylaxis to red meat – the form of the allergy that he was in the process of discovering – after breaking out in hives following a lamb dinner. He then used his own allergy to further his work. “I’m covered in biopsy scars from doing research on myself,” he said. Platts-Mills’ son, James, also a physician specializing in infectious disease at UVA, credits much of his father’s success to loving what he does and his attention to clinical practice. His father agrees, noting that believing patients could get anaphylaxis, a severe and potentially life-threatening allergic reaction, hours after eating meat was a huge jump to make when the reaction to peanuts or bee stings is almost instant. At a stage where many would eye retirement, Platts-Mills remains focused on furthering his work, particularly exploring the possibility of an undiagnosed national epidemic of meat sensitivity among people who show no symptoms of an allergy. He and his team have already linked sensitivity to the allergen spread by lone star ticks to increased plaque buildup in arteries. And as ticks spread, especially in deer-heavy areas like Charlottesville, so could the problem. That’s one more reason he hopes to establish a food allergy institute at UVA, combining lab research and clinical work.